Ok, it’s officially time I get caught up on this photo of the week project I have been doing. We are about to finish our 14th week on the road (crazyness!) and I haven’t done a photo of the week since Week 10. So today you get a big roundup of pictures to make up for all the weeks I’ve missed. 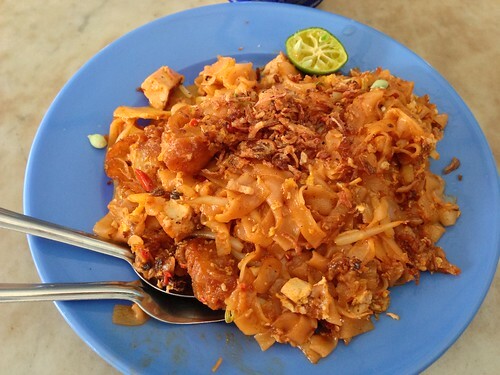 This photo of the week roundup is filled with all of the food we have been eating lately. 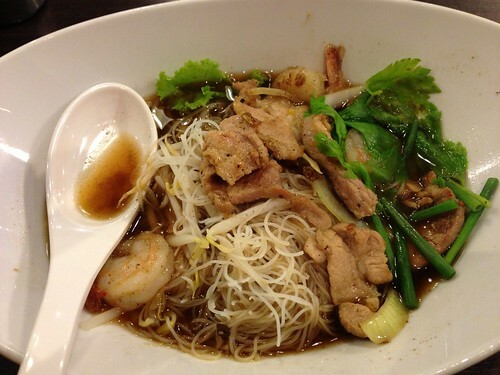 All of this food is from Malaysia and Thailand so you’ll see a lot of noodle dishes, specifically a lot of pad thai since you just can’t go wrong with Pad Thai. Am I right!? Yes, I am. Trust me. You’ll also see that we have caved into some western food the last few weeks. 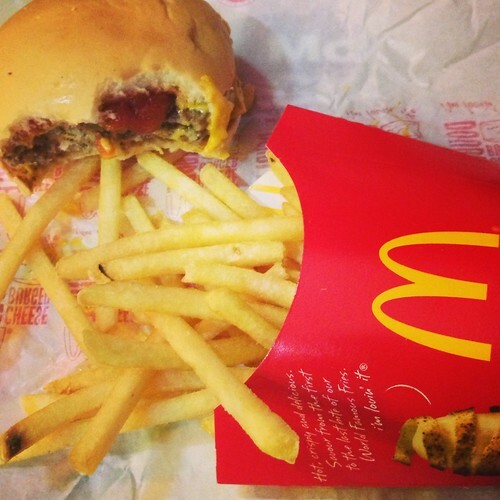 Sometimes a girl just needs a burger and fries or nachos. 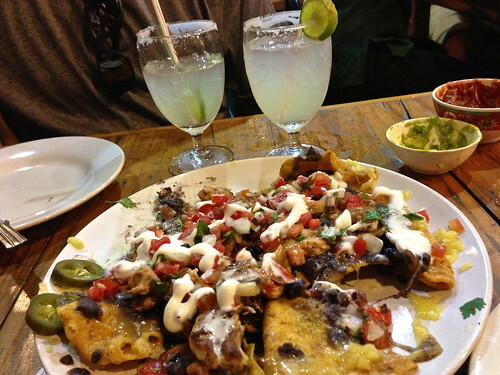 Mmmmmm Nachos! 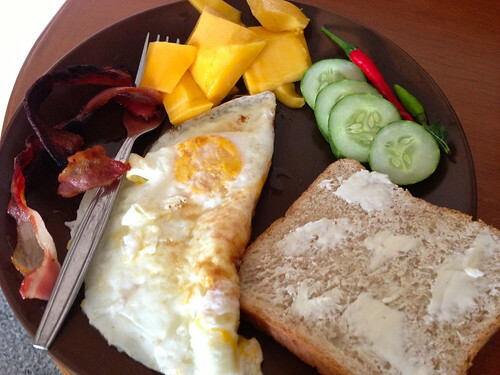 We also have been living in Chiang Mai for a couple weeks now and we have a fridge and a stove so I have been making breakfast every morning and a few dinners. I have been loving our weekly trips to the produce street market. 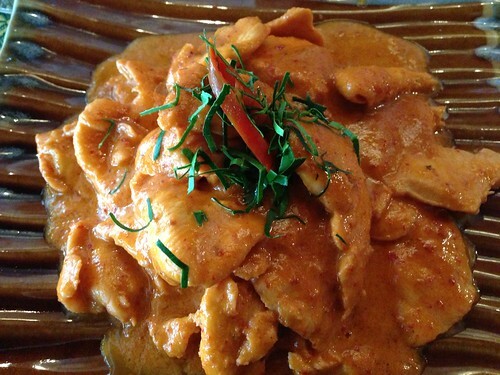 I’ll be writing a post about that for ya once I catch up to Chiang Mai. 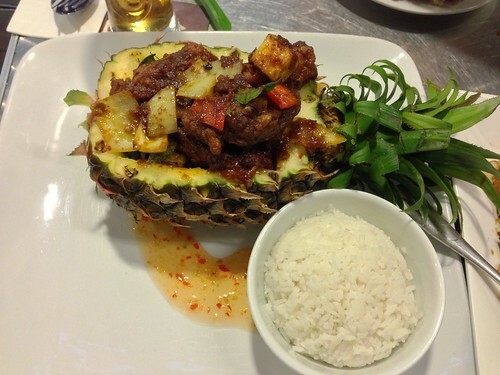 Pianapple Chicken in a Pinapple at U-Cafe in Kuala Lumpur. We’re so mad we didn’t eat at this place until our last night there. 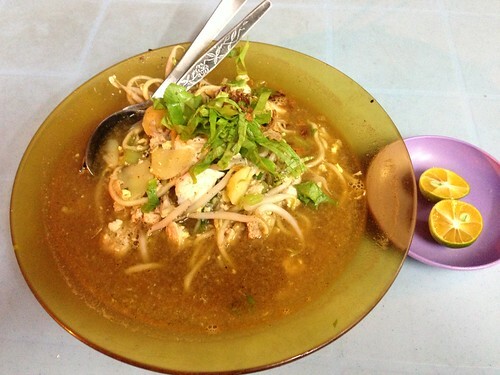 Delicious street food soup with spaghetti noodles, chicken, potatoes, and a handful of delicious spices. 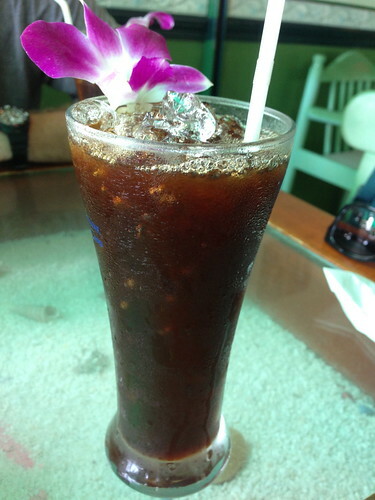 Iced Black Coffee with a pretty flower in it. Stir Fry with fat noodles, vegis, and shrimp. 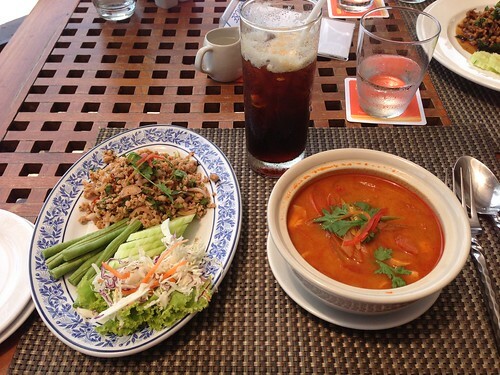 Laab Moo (spicy pork salad) and Tom Yum Koong (spicy as hell shrimp soup). 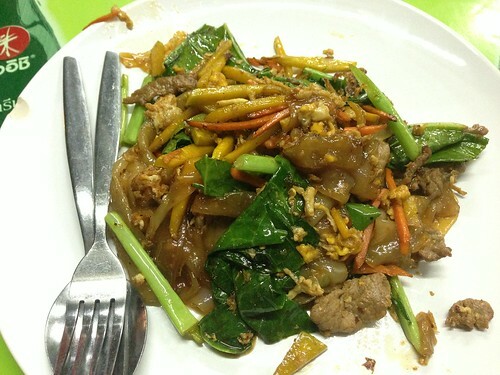 Stir Fry with fat noodles, vegis, and beef. 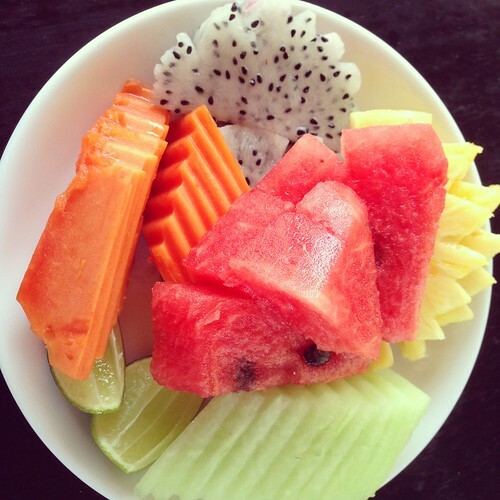 An assortment of fresh Thai fruits. 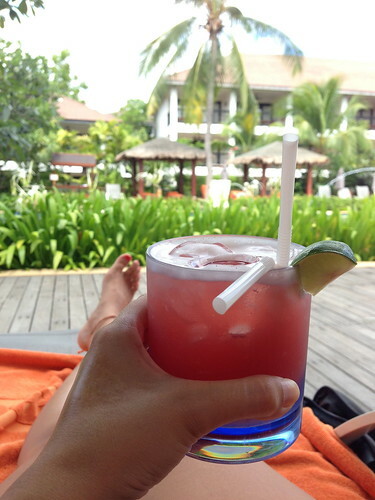 Mai Tai on our last day of our anniversary weekend on Koh Samui, Thailand. 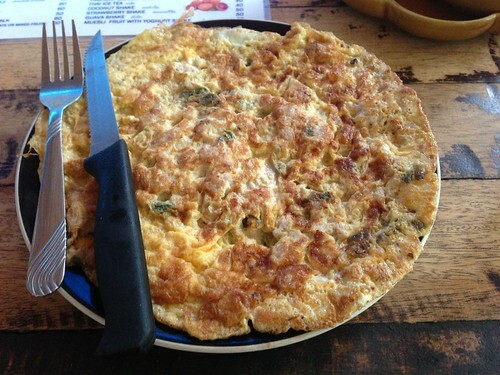 Minced Pork Spicy Omelet from Coffee Boat on Koh Tao – best ever in the whole wide world! 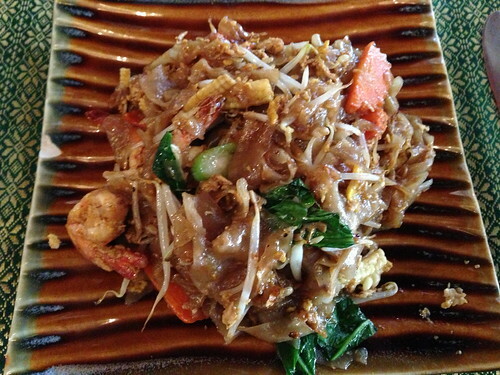 Definitely up there with my love for Pad Thai. Mango and Banana Shake…Yes, I ate a banana! Greg still hasn’t let me live this one down. 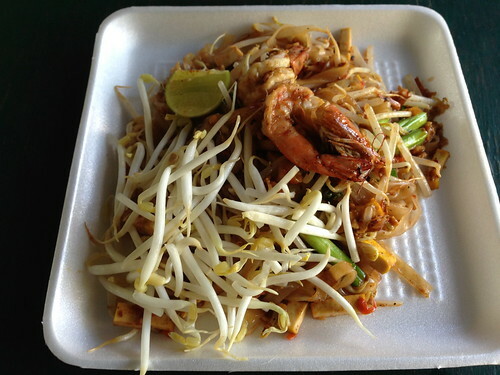 Pad Thai with Shrimp at the Chatuchak Weekend Market in Bangkok. 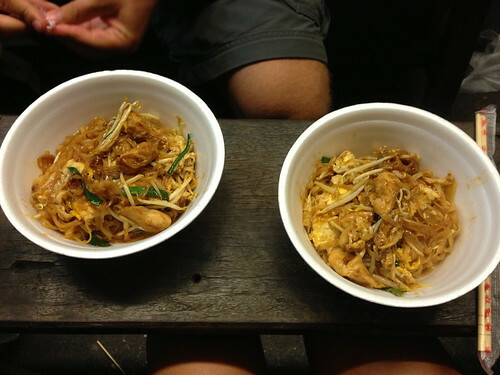 Pad Thai with egg from our favorite street food lady in front of Suk11 Hostel in Bangkok. 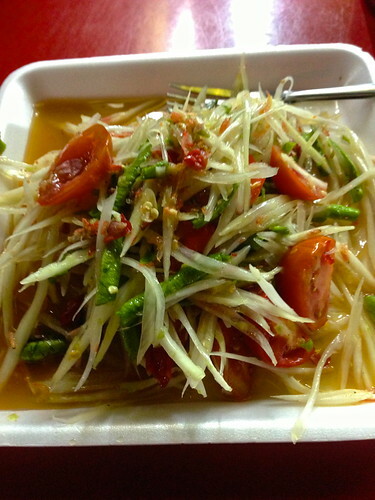 We ate there every night for $3. 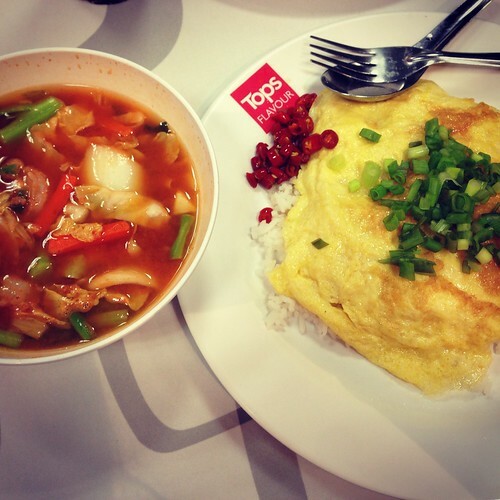 Thai Omelet over rice with Tom Yum Koong. 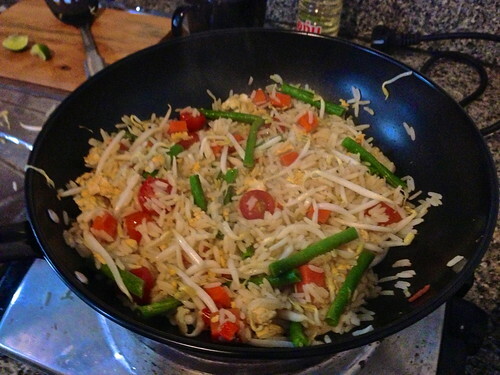 Made this vegi and rice stir fry with the produce we got at the produce street market, Mueang Mai Market. Which of these foods do you want to stuff in your face? 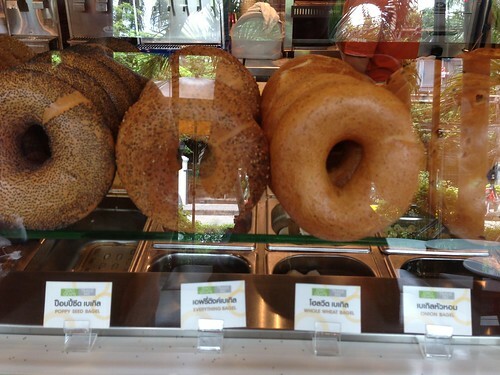 Where did you see those bagels? I’m amazed! 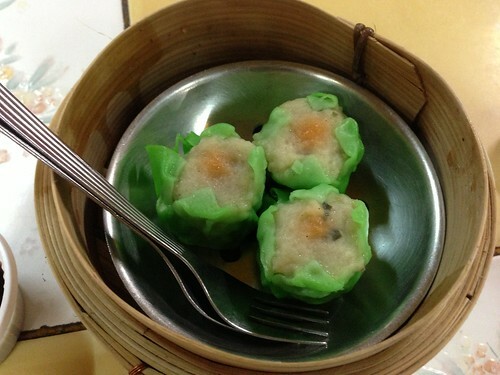 I’ve never seen a place that sells them in Asia. At Au Bon Pain on Sukhumvit Soi 11 in Bangkok. They even had real delicious creamy cream cheese! It was heaven.